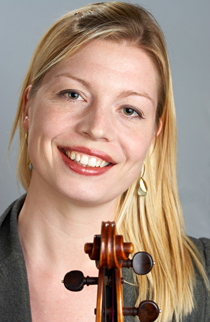 Stine Hasbirk, viola, started her viola studies in 1995 at the Musikhochschule in Frankfurt with Professor Tabea Zimmermann and later in the Soloist Class at the Royal Danish Conservatory with Professor Tim Frederiksen. In 1993 Hasbirk founded the Cailin Quartet with three friends. They took lessons with the Alban Berg Quartet, the Emerson Quartet and Isaac Stern. In 1998 they took 1st prize in chamber music competitions at the Danish Radio and the Swedish International Quartet Competition. With the Cailin Quartet Hasbirk has recorded three CDs. As soloist, Hasbirk has performed concerts of Bartok, Hindemith, Penderecki and Telemann with orchestras in Germany, France, England and Denmark and in 2000 she performed Flemming P. Andersen’s viola concerto written for her with the Anneberg Chamber Orchestra. Hasbirk took 2nd prize in D.A.A.D competition in Frankfurt in 1997, the Special Prize in the Maurice Vieux in Paris in 2000 and in 2001 she won the 1st prize in the Royal Danish Music Competition in Copenhagen. Hasbirk has played in the Royal Opera Orchestra Copenhagen since 2003, and since 1998 she has been playing in the Mahler Chamber Orchestra and the New String Trio Copenhagen. Since 1999 Hasbirk has been invited to take part in the prestigious IMS chamber music weeks in Prussia Cove, Cornwall. She has been awarded several scholarships and grants, among them Van Hauen, Jacob Gade’s Grand Prize, Veuve Clicquot and a James Tubbs viola bow. Her debut recital on November 6th 2002 in Copenhagen received excellent reviews. This year Hasbirk has recorded her second CD including Schubert, Brahms and Schumann sonatas.